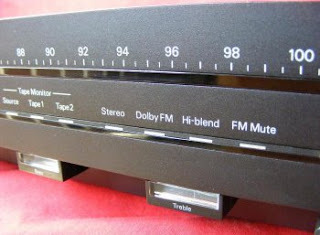 When most people hear Nakamichi, they think of cassette decks. 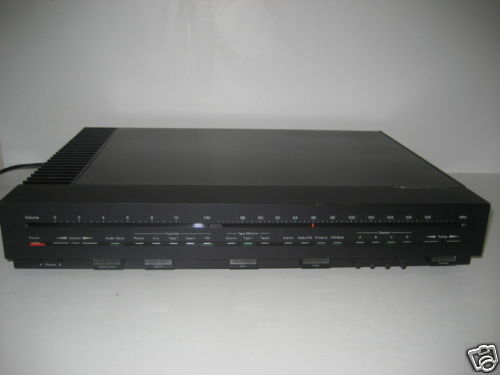 Nakamichi also manufactures components with the same obsession to detail as all of their other products. The Nakamichi 730 Receiver was manufactured between 1978 and 1981 MSRP $1400. A long, narrow slot along the entire width of the upper section houses an FM dial scale and a green ribbon of light that shows volume. Other controls include mute, adjustable loudness compensation, bass, treble, balance, and volume contour (adjusts the sensitivity of the volume control to match your listening environment). It has a very slim clean front panel with no mechanical buttons, only touch sensitive pads. All front panel switches are touch sensors. It also has some neat features: motorized volume control, motorized analog tuner with presets, very cool to watch. Four FM stations can be preset. The amplifier section is rated for 105 Watts per channel into 8 Ohms and 150 Watts per channel into 4 Ohms. This is a very good sounding receiver with a very robust power supply. It can get very loud, and will drive any speaker here to room shaking levels! Output is 105 watts/channel @8ohms, 150 watts @4ohms 5Hz-20Khz with less than 0.02% THD. On the back, in addition to the normal inputs, are Preamp Out and Main In jacks with connecting jumpers, so it can be used as a standalone pre- or power amp. The unit is in excellent cosmetic and functional shape. This is a slim style case, Dimensions are 20" wide, 14.5" deep, and only 3.75" tall. Weight is 38 pounds. The 730 is one of my favorite receivers in the world.